Mail4Rosey: One Child Will Become the First Official #ZulilyCutie Enter June 6 - 15! 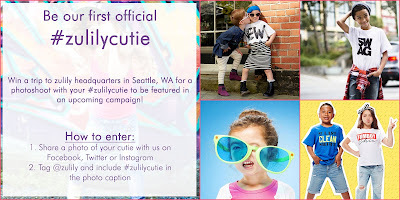 One Child Will Become the First Official #ZulilyCutie Enter June 6 - 15! Zulily is offering a once in a lifetime opportunity for one very lucky winner!! What are they looking for? They're looking for a Zulily Cutie!! Just what does that mean?? A #ZulilyCutie above all is a cutie who embodies the Zulily spirit. What makes Zulily unique is that they use real people as models to tell a story around the products you love. The models are everyday you and me, unique in the many ways that humans are... in short, a #ZulilyCutie exudes individuality, style, personality and fun! A featured blog post on The Find, which is Zulily's behind-the-scenes daily dose of newest looks and interesting content! How do you enter? It's simple! Watch the Zulily social channels for the announcement of the contest kick-off on June 6th, when you will then be able to submit your photo entries. 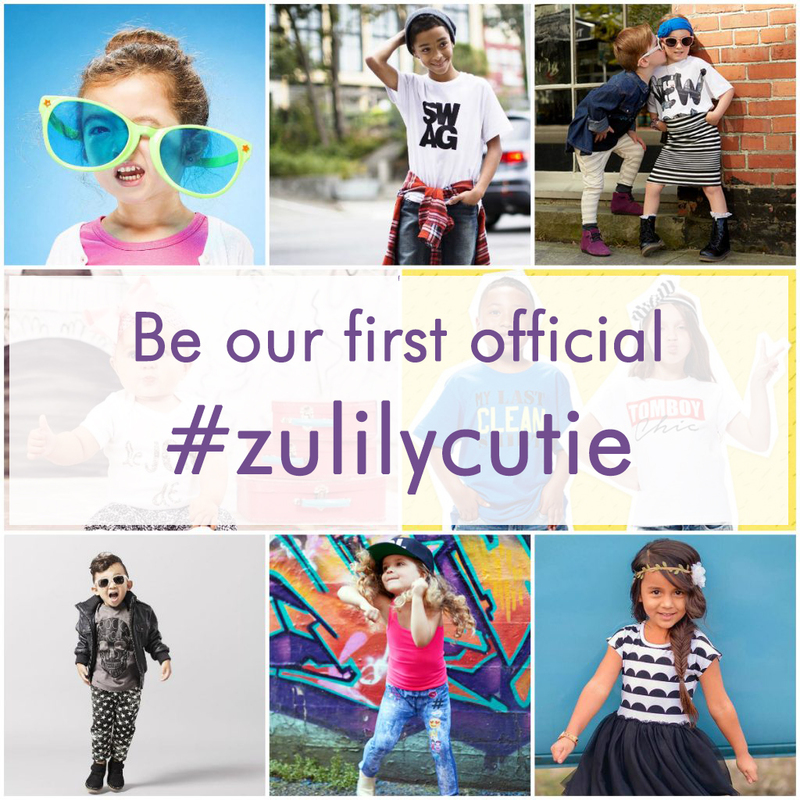 On Instagram or Twitter, share a picture of your cutie, making sure to tag @zulily and using #zulilycutie in the caption. The contest will run from June 6th, 2016 to June 15th, 2016. Click here for the official rules. Good luck to all who enter! What an awesome contest! If my kids were younger, I'd totally enter them. Awesome!! I'm even a Zulily affiliate and totally missed this! It's one of my favorite places to shop and find new things - SO many cute outfits and home decor!!! I've loved everything I've bought there and will have to enter my cutie in this! Oh boo..we can't enter because we don't live in the us. Will have to keep peaking to see who wins :)! Oh I have to enter my kids in this! We love Zulily! Thanks for posting! Is there any voting or does the company choose the winner? Begging for votes makes it so hard. This is such a fun idea! I have a few photos of my granddaughter that I should enter into this contest. That will sure be neat for some kiddo to win. This is such a great contest! I would love to enter my girls. Such an awesome opportunity for little ones to participate in! What a fun contest to have. I love this. What a great experience for the kids and their family! That most certainly sounds fun! I bet a lot of kids would enjoy being a model. What an awesome contest! I love Zulily! I need to share this fun contest with my sister. I think both of my nephews would make amazing Zulily cuties! What a great contest! I should enter my daughter, she would love it. This looks like so much fun. I love Zulilly! Sounds like a fun little contest. I am sure there are going to be tons of little cuties getting entered into this one. We absolutely LOVE Zulily! I'll have to enter my twins! It would be awesome if one of them won! What an awesome prize. Someone is going to be super happy to go to that shoot! I bet they will have a hard time deciding on the winner.... so many adorable kids! What a fun contest though! This is such a great contest! How are they going to pick from all the cute kids who enter?! How fun. What a great contest!! This will be a very popular contest. I have purchased many things from Zulily. this is such a great contest and the clothes and styles they have for kids on Zulily are awesome! Good luck to all the prospective zulilycuties. May their parents not put too much pressure on them, and may they have fun in the process. I love Zulily! Good luck kiddos! What a wonderful opportunity for wee ones to participate in! Is there any voting process or does the company choose the winner? Love this! It's going to be fun to see the winner. Zulily has so many cute outfits. There are going to be so many little dolls entering. How fun this is for parents! What a fun contest! I lov shopping at Zulily. They've got all kinds of great products at great discounts. I heard so many good things about Zulily. I am so glad they run a contest like this. Wow, I bet kids all around the country would go loco with this opportunity. I love how the model represents the company and how they should select the winner. A Zulily shopping spree sounds like a wonderful prize!! Wow, sounds a wonderful privilege. I want my son to have a Zulily shopping spree too! Oh wow what an awesome opportunity! Makes me wish that I had a child that was young enough to enter! What a fun contest. I know my daughter would love to do it for a shopping spree!